Prepared with 1 ounce Parmesan cheese. 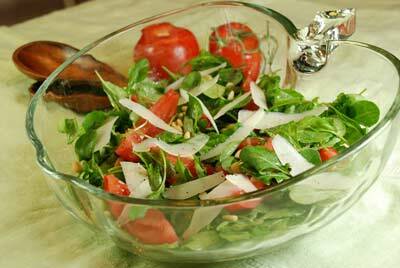 Place arugula in serving bowl and toss with lemon juice and olive oil. Add tomatoes, pinenuts and parmesan cheese and serve. Save $0.50 on ONE Always Ultra OR Maxi Pads 11 ct or higher (excludes Radiant, Infinity, Pure Clean and Always Discreet).